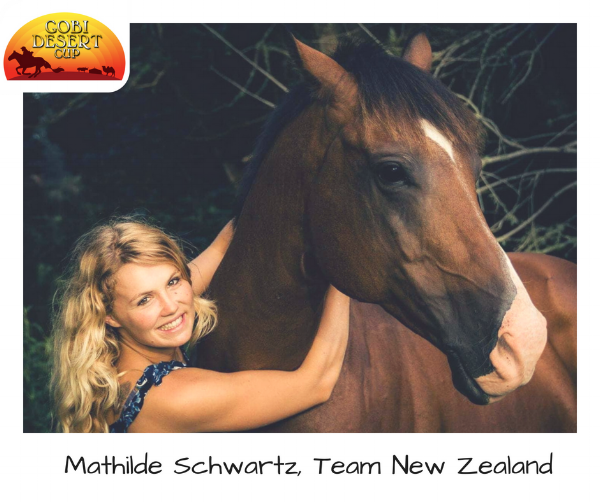 MATHILDE SCHWARZ (FRENCH) riding in New Zealand TEAM as that is where she lives. Originally from France but leaving in NZ for many years. I have been riding for 20 years. I have got 2 sport horses, 1 pony, 1 Clyde x and 1 mini. Fun, adventure, have fun and do something different. Every year I want to do something special so this year is the Gobi Desert Cup. Also meeting Mongolian people and their horses, and feeling this amazing spirit. I did two endurance rides but I will do more this month and next. My biggest achievement will be the relationship I have with my horse Casanova. He is just really special to me, he is not perfect but every moment with him is special. I am doing a lot of free riding with him, no halter, no saddle, nothing. Galloping full speed on the farm. My other achievement will be winning two pre-training eventing rides with my 5yos this year. I am really excited about our future. Bringing my five-year-old all the way to 2 stars. And keep going with show hunter with my other one to 1m10. Keep training and selling ponies. Have been riding pony my whole life. Riding one to two horses every day. And every weekend when I'm not competing trying to go for a three-four hour ride. To successfully complete the whole race.